The airline confirmed one of its planes, due to fly from Louisville, Kentucky, to Baltimore, Maryland, was evacuated before take-off on Wednesday. "We are working with the authorities and Southwest now to recover the device and confirm the cause," the company said in a statement. A Southwest Airlines spokesperson told the BBC: "A customer reported smoke emitting from an electronic device. All customers and crew deplaned safely via the main cabin door." The owner of the phone, speaking to Jordan Golson from The Verge, said it was bought on 21 September. Brian Green added that there was a black square icon on the device's packaging, a symbol which Samsung added to distinguish old, certified unsafe devices from the replacement models. But late last month, after assuring customers - and safety officials - that the fixed devices were safe, Samsung confirmed it was looking into new reports that devices were still overheating. "There have been a few reports about the battery charging levels and we would like to reassure everyone that the issue does not pose a safety concern," the South Korean firm said at the time. Mr Green said his device was powered down, not charging, when it began to overheat in his pocket. After tossing it on to the floor of the plane, it started to emit a "thick grey-green angry smoke", according to The Verge. 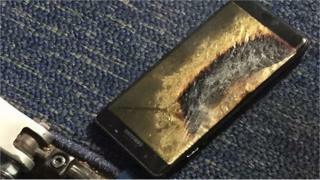 The US Federal Aviation Administration (FAA) had issued a warning to the public saying Note 7 devices should be powered down and not charged while on planes. The FAA is yet to comment on whether further guidelines will be issued after this latest issue.